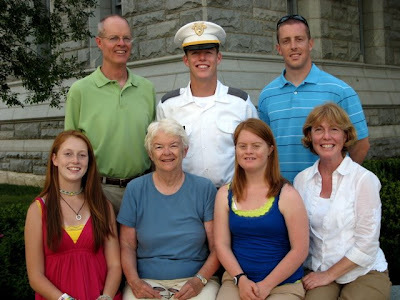 I joined my nephew’s family on Saturday morning, August 23, 2008, for a very special day at the United States Military Academy at West Point – A-Day, short for Acceptance Day. My grandnephew, Stephen Schnorf and the other “new” cadets had finished “The Beast,” as the summer Cadet Basic Training is known. Traditional ceremonies merge them into the Corps of Cadets. 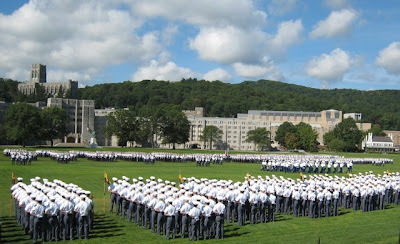 Prominent alumni from classes, which will celebrate fifty-year reunions during the four years of the current Cadet classes, served as reviewers. The upper classmen marched out of the arches on the far side of the field. of the field and turned to face the upper classmen. After the appropriate ceremonies, the plebes marched across the Plain to join the corps. The entire ceremony was quite moving, and one couldn’t help but feel the power of the long years of tradition. Stephen had the rest of the day off, his first in many weeks. In between meals, our hungry cadet showed us around the base. 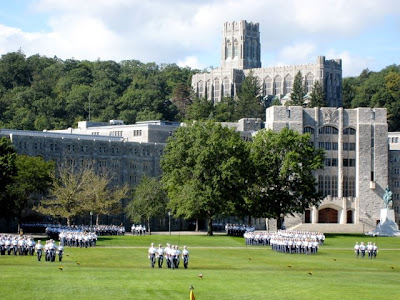 Please note that West Point is referred to as a base, not a campus! I’m slowly learning the lingo. I was so grateful for the opportunity to be part of this day! The Schnorf family and Mary Mettler. From West Point, I returned to Carlisle, Pennsylvania and a day at The U.S. Military History Institute (MHI) at the U.S. Army Heritage & Education Center (AHEC). What a great place and a superb resource for military history! MHI has some 15 million books, military newspapers, manuals, periodicals, letters, diaries, oral histories and other manuscripts, as well as a powerful computer search capability. You enter your military ancestor’s name in the computer, and it identifies his unit and a list of sources for that unit. I entered a first cousin-three times removed, who had been a surgeon in the Civil War. The list included three units in which he served and the sources of information on those units. I was able to document his entire service and all the battles at which he participated, including Gettysburg. Their catalogs and online information are available at www.USAHEC.org. While you are doing genealogy, the rest of your family can walk around The Army Heritage Trail, an interactive outdoor museum with exhibits from the French and Indian War through Vietnam. Now, the bad news. They, too, told me that no information is available on where the Pennsylvania Militia units served in the Revolutionary War. They considered it very lucky for me to have found Capt. John Lamb’s initial service in the pension of a soldier in his Company. One excellent source, however, was a pamphlet, Understanding Pennsylvania’s Revolutionary War Military Organization as an Aid in Genealogical Research by Col. John B. Trussell, USA-Ret. It not only explained how the Militia and the Continental Line were organized but also identified the three types of service the Pennsylvania Militia provided, namely augmentation of the Continental Army in conventional operations, protecting the frontiers from Indian attacks and providing guards for the supply depots and prisoner of war camps in Pennsylvania. Trussell said that the latter was by far the type involving most of the men who saw active duty. The massive Pennsylvania State Archives in Harrisburg was my last vain attempt to identify where Lamb’s militia unit served. For his company, I found lists of delinquents and fines and some teasers, such as his expense report for reimbursement for pay for twenty days of drummers and fifers. Alas, there was no information on where these troopers went! These archives house many other records, e.g. land records, many of which can be ordered or even accessed online at www.phmc.state.pa.us. I’m at my sisters’ house in Akron, Ohio for the Labor Day weekend and then plan to begin the trek home with a couple of stops along the way.